Aberdeen, often referred to as "The Flower of Scotland" due to its many parks and gardens, lies in a picturesque spot on the North Sea between the Rivers Dee and Don. The capital of the Grampian Region, Aberdeen is Scotland's biggest fishing port, an important center for Europe's offshore oil industry, and the ferry terminus for the Orkney and Shetland Islands. Tourists can enjoy its two miles of sandy beaches, superb golf courses, shopping streets, theatrical and dance performances at His Majesty's Theater, concerts by top-class orchestras in the Music Hall, and a variety of arts festivals during the summer months. There are always plenty of things to do in Aberdeen by day or night. Silver-gray granite from nearby quarries gives the city a distinctive character, and when the sun shines, the mica in the stone sparkles, an effect that led to Aberdeen's other nickname, "Silver City." Aberdeen has a number of protected historical buildings, the oldest of which dates from the 16th century. St. Machar's Cathedral is believed to occupy the site of a small Celtic chapel erected by St. Machar in AD 581. The succeeding cathedral was founded in 1136, although the earliest work in the present building dates from the 14th century (it was completed in 1552). Note the striking towers on the West front, with their sandstone spires dating from 1518 to 1530, and the 16th-century wooden ceiling painted with coats of arms. Founded in 1494 in what's known as Old Aberdeen, the University and King's College of Aberdeen received its charter from King James IV. One of the college's identifying features is its huge tower (1633) and an elegant stone dome, the only remaining structure of its kind in Scotland and notable for the stone replica of the imperial crown of Charlemagne that sits atop it. The 16th-century oak choir stalls and wooden ceiling in the chapel are preserved in their original form, and portraits of the Stuart monarchs are carved in wood. A free zoology museum covers everything from protozoa to whales. Self-guided walking tours of the university are available from its website. Located on the King's College campus, the Cruickshank Botanic Gardens are well worth a visit and contain displays of interesting alpine and sub-tropical collections, as well as a delightful rock and water garden. Also of interest in this peaceful 11-acre site are a sunken garden, rose garden, shrub and herbaceous borders, and an arboretum with a fine collection of more than 2,500 labeled plants. Walk through Seaton Park down to the graceful stone Brig o'Balgownie. Built on the orders of Robert the Bruce and restored in 1607, it served as the River Don's main crossing point. Lord Byron, who went to school in Aberdeen for a short time, referred affectionately to the single span bridge in the 10th chapter of Don Juan. Another fine old bridge is Brig o'Dee. Dating from the 1520s, it's decorated with interesting coats-of-arms and inscriptions and is set in lovely Duthie Park, famous for having one of the largest winter gardens in the world. Evidence of Aberdeen's old medieval town can still be seen around Castlegate, which centuries later is still very much the focal point of the city. While there's no longer a castle here, the tower of the 14th-century Tolbooth (formerly the town hall and prison) is Aberdeen's oldest building and home to a museum with fascinating displays on the development of crime and punishment. Exhibits include 17th-century cells as well as the "Maiden," the blade from the city's guillotine. Diagonally opposite it and adorned with a white unicorn stands the Mercat Cross, a medieval symbol of Aberdeen's right to hold a market. The town cross was built in 1686 by Aberdeen's guild of merchants. Portrait medallions show the heads of the 10 Stuart monarchs from James I through to James VII, Charles I, Charles II, and Mary Stuart. Another interesting nearby landmark is St. Andrew's Cathedral. And be sure to also take a stroll down Union Street, Aberdeen's busy main street. Over 200 years old, it's a bustling street with plenty of shops, cafés, and shopping arcades. A beautiful year-round floral experience, the David Welch Winter Gardens at Duthie Park is one of Europe's largest indoor gardens, filled with rare and exotic plants from all over the world. Along with a large collection of cactus and other succulent plants, the gardens feature the Temperate House, Tropical House and Arid House, Victorian Corridor, Corridor of Perfumes, the Fern House, and a Japanese Garden. The 44-acre Duthie Park has open green spaces, trees, beautiful seasonal flower beds, and cascading ornamental ponds. A bandstand hosts concerts and the summer Opera in the Park. Built in 1884, the Aberdeen Art Gallery houses a comprehensive collection of 17th- to 20th-century paintings. Scottish artists with work displayed here include Charles Rennie Mackintosh, William Dyce, Thomas Faed, John Philip, and other representatives of the Glasgow School. George Jameson, Scotland's first portrait painter (1589-1644), also has works on exhibit. Among the most famous are portraits by Raeburn and works by William Turner; David Hockney; and Impressionist painters, including Monet, Sisley, Bonnard, Pissarro, and Renoir. Sculptures by Barbara Hepworth and Jacob Epstein are displayed in the well-lit entrance hall. The museum also displays interesting collections of British silver, glass, and ceramics. Sir George Skene of Rubislaw, provost from 1676 to 1685, was a prosperous merchant whose wealth came from trade with Gdansk. His former home - the oldest standing residence in Aberdeen - now houses an excellent museum with displays of locally excavated artifacts, religious paintings, and period costumes. Also of interest is the plasterwork in the old 17th-century bedroom and the painted wooden ceilings from the same period in the picture gallery. Run by the National Trust for Scotland, Crathes Castle is a classic example of a Scottish baronial-style castle. The tower house, with its small oriel windows, corner towers, and windows of varying sizes, was begun in 1553. Its upper stories are worth a tour, if only for a glimpse of the beautifully painted wooden ceilings dating from 1600. The figures depicted in the Room of the Nine Nobles - typical of the decorative work of the time - are the ancient heroes Hector, Julius Caesar, and Alexander the Great; three Old Testament characters; and three famous rulers, including King Arthur and Charlemagne. The castle also has its own ghost in the Green Lady's Room, where the ceiling is also painted decoratively. In addition to lovely gardens, the castle has a café, gift shop, an adventure playground, and treetop trekking. About a 25-minute drive from downtown Aberdeen, Crathes Castle can be reached by bus and a short walk. Located in the interesting, old 16th-century Provost Ross's House, the Aberdeen Maritime Museum contains an excellent collection of models, photos, and paintings documenting the development of the Dee estuary's port, as well as the arduous life of the whale-hunters, herring fishermen, and North Sea traders. Also on display are the legendary Aberdeen clippers that American ship owners used to secure their monopoly over the trade in China tea, including the Stornaway, a prototype produced for Jardine Matheson in 1850. The museum also has exhibits on modern oceanic pursuits and is the only one in the UK with displays about the North Sea petroleum industry. This delightful castle, with its small towers, crow-stepped gables, oriel windows, conical roofs, ornamental stone cannons, and decorative zigzag console, is proof that fairytales do come true. The estate was first mentioned in documents dating from 1457, when it was owned by the Mortimer family, and today this towering seven-story residence stands as a symbol of authority and wealth, as well as practicality. Wood for building was in short supply in the Highlands, so architects exploited every inch of space under one small roof. The plasterwork in the Great Hall, the huge Stuart coat-of-arms above the fireplace, and the carvings on the wall paneling were created in Renaissance style. A secret flight of steps leading up to a small room above a window in the Great Hall forms part of a complicated system of stairs within the tower. Queen Elizabeth II's summer residence in Scotland has come to embody the Neo-baronial style of the Victorian era. The estate was first mentioned in documents in 1484, and after Queen Victoria bought it in 1852, she commissioned the Aberdeen architect William Smith to implement plans drawn up by her husband, Prince Albert. Inside the castle, the Ballroom, with its paintings and other objets d'art and also a collection of coaches, are open to the public but only when the royal family isn't in residence. The extensive parkland is ideal for a relaxing stroll. The nearby town of Braemar is lovely to explore but is most famous for its annual sporting event, the Braemar Gathering. Known widely as the Highland Games, this Scottish equivalent of the Olympic Games has been held here every autumn since 1832. If you can't make it for the games, visit the Braemar Highland Heritage Centre, which has exhibits on the history of the games and Scottish traditional sporting. Balmoral and Braemar are a little over an hour's drive from Aberdeen, but well worth the trip if you have a car. This annual 10-day festival features daily performances by amateur groups from around the world. Although all artists are under 23 years of age, performances are always of the highest quality and include everything from orchestral, choral, and chamber concerts to opera, dance, and theatrical performances, as well as art exhibitions. Events take place across the city, including in His Majesty's Theatre, the Aberdeen Arts Centre, the Music Hall, and other prominent buildings. Luxury Hotels: A few blocks north of Union Street, Skene House Whitehall has suites with kitchenettes, free parking, and breakfast, but no elevator. In the same neighborhood, Hilton Garden Inn Aberdeen City Centre has large rooms and is also close to restaurants, shops, and the theater. Skene House Rosemount has apartment-style accommodations, with free parking and breakfast, close to Union Street but quiet at night. Mid-Range Hotels: Jurys Inn Aberdeen is right by the train station and ferry landing, handy to restaurants, shopping, and the airport bus, which stops at the hotel's front door. 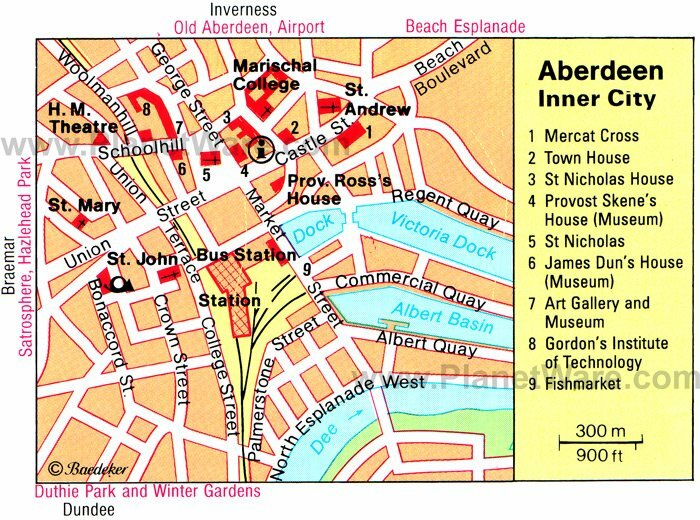 Premier Inn Aberdeen City Centre Hotel is just north of Union Street, near the Tolbooth Museum and Aberdeen Art Gallery, and an easy walk to the railway station. Just north of Union Street, Holiday Inn Express Aberdeen City Centre has free parking and includes breakfast. Budget Hotels: Although it's a 10-minute walk from Union Street, Beeches Aberdeen has a bus stop directly in front of the inn and includes free parking and breakfast. Mercure Aberdeen Caledonian Hotel is on Union Terrace, in the heart of shopping and restaurants and an easy walk to attractions. Right at the harbor, near the bus and train stations, Ibis Aberdeen Centre is across the street from the Maritime Museum and a few steps from Union Street shops. Visitors traveling north from Edinburgh to Aberdeen along the east coast of Scotland should stop to see Dundee, Scotland's fourth largest city, on the north bank of the Firth of Tay. Nearby St. Andrews will appeal to more than golfers, and Fife has attractions of its own. Head west through the vast Cairngorms National Park to reach Inverness, gateway to Scotland's spectacular Highlands, and to the great Glen, a string of lochs that includes the most famous of them, Loch Ness.